Loaded with emergency information, this PDF document shows the diamond-shaped placards that identify contents of tank cars. 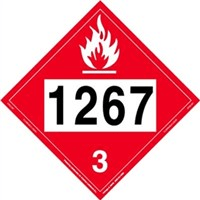 High Hazardous Flammable train placards to watch for: Crude oil carries the number 1267 on the placard, and ethanol can be 1203, 3475, 1987 or 1170, depending whether it is mixed with gasoline and it’s purity. Placard 1203 – Basically gasoline, a blended fuel with up to 10% ethanol. Placard 3475 – blended fuel with 11% to 94% ethanol. Placard 1987 – Denatured fuel ethanol, 95% to 99% ethanol . Placard 1170 – Neat ethanol, 100%. SafeBenicia.org, the website for Benicians For a Safe and Healthy Community (BSHC). Volunteer or order one of their yard signs. Contribute a little or a lot for the BSHC organizing effort – go to their GoFundMe page. And you can buy a Stop Crude By Rail t-shirt, coffee mug, stickers and other cool stuff to support the cause at cafepress.com/safebenicia. PROJECT REVIEW, critical studies of Valero’s Crude by Rail proposal by the Natural Resources Defense Council and comments submitted by YOU, the public, for the record. See also an impressive subsection of Highly critical reviews at close of public comment period. Sightline – Oil Train Explosions: A Timeline in Pictures – Ten explosions in two years, and no end in sight. Posted on 5/6/15 after the Heimdal ND explosion, to be kept current. The DOT-111 Reader, News and information about DOT-111 rail tank cars, etc. Bomb Trains on Facebook – Notable Crude Oil Train explosions 2013-14, the big blasts through April 30, 2014.